That's some nice looking woodwork! Great dual purpose. ok you got me. what is the bang stick?the bolt handle looks different somehow. but I agree with Joe thats a nice piece of woodwork its wearing. the bench looks fine n dandy as me ol mate Forest Gump would say. Looks real good to me. Especially the screw! It should also come in handy for holding a rifle while working on it. A friend of mine is real handy with wood. He even made a clock out of wood with wooden gears. I like ya work Suz...both the rest and the work stand look pretty darn good to me. Do you have any planns to make it a little heavier to make it more stable, or is it good as is? I'm intrigued by the wooden screws...do you have a machine or tool to make them...they look really cool. When I first looked at the stock on your rifle I thought, laminated...but going back and looking properly at it I can see that it is a decent piece of timber with a good grain. Vince the bench rest attaches to a portable table that has adjustable front legs I can weight down but it still jumps a bit when I shoot. The rest also has a screw leveler towards the back that adjusts up and down. I'll have to get some photos of it all together. I make the screws with a store bought screw box and tap. 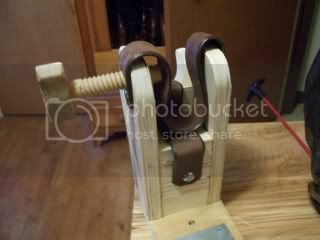 It's a wooden ole fashioned screw maker that they still make today. This one is 3/4 inch. 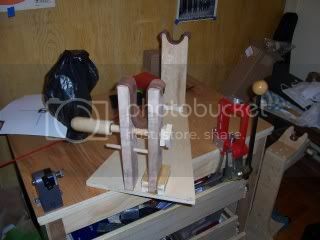 Ya just put a 3/4 inch wooden dowel in it and turn around and around and it cuts the threads. I wish I had more things to make with screws, I love them. 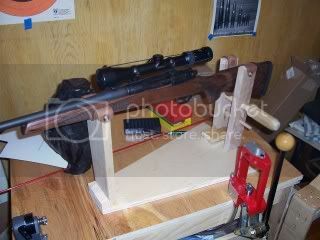 Elvis the wood is laminated, I know it doesn't look like it but it's actually from a Remington 798 which is their version of a 98 Mauser. You can buy them all ready to drop a Mauser action into for about $100. couldn't beat the price and that includes a very nice recoil pad and sling mounts screwed in. It needed very little inletting. I thought it was ugly from the photos of it on Stockysstocks.com I'm warmin up to it, once you realize it's laminated you can appreciate that it doesn't look like those LSD tripped dyed laminated things. It looks like a natural grain but it's laminations cleverly done to look nice. 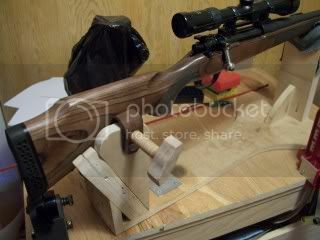 The rifle is an old military Mauser 98, cut the bolt handle off and put on an after-market handle that slips over the stub of the old handle and is then tapped and bolted on. I had a .270 barrel put on it and I haven't gotten to shoot it much--maybe 20rnds--but it shoots very politelly and I'm so so so sosososososo very pleased with it. Can you tell I was glad you asked?!?!? I've been able to shoot rounds within an inch grouping at 100yds and I want to better that just by improving my shooting technique and some decent reloads I think I can do that. Nice...What did you use to cut the threads on the hand screw? Looks good Suzanne,very impressed with your work. This ain't no dress rehersal. 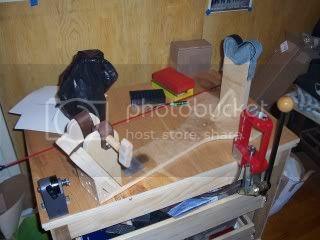 Here's a screwbox and tap, it's not mine, this photo is from a place that sells em. one tap is for a through hole the other is for a stopped hole. Neat. 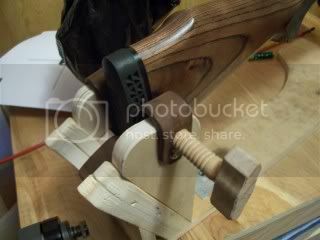 I knew about wood taps and dies, but never seen one. Bushy!!! I guess you've never had a stopped hole. I was thinkin of a stopped dado, thought it might translate well for a blind hole. My hole's never blind tho. I've never used the blind hole tap and don't really understand how it works, seems like you could go too far and strip the freshly made threads. I'll have to try it sometime. The screw box works so neatly, cuts very cleanly and you put some candle wax on the threads, they'll turn without a squeak and are very strong. I think we have gone as far with this as I am willing to let my "Navy" mind go on this.